How can we build a global scientific data commons for agriculture and food? That was the big question on my mind when, at the invitation of Agroknow, I set off to Chania Greece for an event called Open Harvest. This event brought together organizations from around the world who are all engaged in research, knowledge, and capacity development related to agriculture, food, nutrition and the environment. Organizations like GODAN, CGIAR, INRA, CABI, CAAS, ISI / DRTC, EMBRAPA and many more. It is always special when a network of organizations like this are brought together as it provides a forum for knowledge sharing and collaboration. The first two days of Open Harvest were done workshop style with groups discussing how they define a “scientific data commons” and “shared scientific data infrastructure”, why we need it, and how it relates to relate to specific initiatives & agendas organizations are working on. A big topic was open data. Open data is data that can be freely used, reused and redistributed by anyone – subject only, at most, to the requirement to attribute and share-alike. Everyone made reference to the FAIR principle. Data must be Findable, Accessible, Interoperable, and Reusable. Discussion related to these questions and open data was wide-ranging touching on policy, privacy, security, standards, technology, research, services, management, and how best to collaborate around this work. On the third day I gave an opening keynote which I called “Beyond Licensing: the social and economic aspects of building an open data commons.” Drawing on insights from the recently published Made With Creative Commons I aimed to provoke new thinking about not just how to make data open but about how a commons works and the innovations and economic potential it has. Sustainability = open resources + social good + human connection. Sustainability relates largely to open business models and the ability to generate revenue to sustain operations. Open resources are digital goods that have been licensed, (usually using Creative Commons), to be freely and openly available for others to retain, revise, reuse, remix, and redistribute. Human connection refers to prosocial human connection that openness enables. A move from anonymous market transaction to co-creation interactions where a community is built up around the resources being shared. Let me use the lens of this equation to share what I learned at Open Harvest and describe what I see as the next steps for creating a global scientific data commons for agriculture and food. So just what are the resources organizations have that could be made open and shareable? They are many and diverse including things like policies, practices & processes (workflows, data management plans, …), models, ontologies/semantics/metadata, technologies, and data. Focusing simply on open data is limiting. We’re really talking about a whole ecosystem of openness including open policy, open knowledge, open practices, and open data. When I look at a collection of open resources like this I think about which ones will be the most important and valuable to the consortium. But I also look at what resources will be most valuable and helpful for the intended beneficiary – farmers and industry. The strategic themes and the drivers for industry needs mapped out in Campden BRI’s Innovation for the food and drink supply chain document does a great job of defining the practical and applied resources needed. I wish there was something similar for farmers. When you have such a large number of organizations doing related work it is helpful for there to be a level collaboration and sharing taking place to reduce redundancy and ensure interoperability of outputs. An event like Open Harvest shows just how important that is but going forward there is a big need to look at some overarching mechanism for ongoing collaboration and coordination. There needs to be a means for participants to identify what they have in the way of resources and what they need. A means for inter-organizational collaboration and exchange of shared resources. A coordinated effort toward a common goal. In 2016 world leaders at the United Nations adopted 17 sustainable development goals. Goal number 2 is – “End hunger, achieve food security and improved nutrition and promote sustainable agriculture.” Clearly this is a major social good, one that all the organizations at Open Harvest are working in support of. The social good being generated through the work of Open Harvest participants encompasses many of the other sustainable goals too including: poverty, health, gender equality, water and sanitation, energy, economic growth, and sustainable consumption. The extent to which the resources coming out of Open Harvest organization work can be directly shown to positively contribute to the realization of these goals should be a metrics dashboard by which their success and impact is measured. Having open resources that contribute to social good attracts participation. Ideally the resources are of interest and useful to large numbers of people. At Open Harvest I found myself listening to what others were saying with an eye to who is generating resources of interest not just to government and researchers but to farmers and citizens. One of the big opportunities associated with openness and creating a commons is the way it opens up participation and engagement to everyone. It not only levels the playing field it invites new players to engage. However, going from an autonomous, proprietary, all-rights-reserved model to an open one that provides access and promotes reuse is a big change. For this to become widespread it will require incentives, new means of evaluating performance, and clear articulation of benefits. When thinking about what open resources to create and share I think about which ones will generate the greatest interest, the largest number of users, the most impact. What resources provide maximum value? If we have an Internet of Things with sensors collecting data related to food and agriculture what data will be of interest and use to consumers and producers? Which resources are relevant globally? Which ones have the potential to build a community of users around who all engage in using, improving, translating, localizing, and updating the resource? Ensuring open resources, including open data, have impact involves building a relationship with those who benefit from the use of those resources. In my experience the social and community based aspect of openness is the one part of the equation least attended to. And yet I would argue it is the most important. If we are going to build a global scientific data commons for agriculture and food then lets build one that provides access to all, maximizes participation, generates value collectively, spurs innovation, and brings people together for a common cause. Lets not use openness to just improve existing practices but rather to do innovative things not possible any other way. I commend the Open Harvest participants for putting together a fantastic Open Harvest 2nd Chania Declaration and Call to Action mapping out a way forward. Special thanks to the Agroknow team for hosting an amazing event and to all the participants for welcoming me and sharing their work and aspirations. Originally published as Agroknow blog post 19-June-2017. The open business models work I wrote about in my previous Edtech Frontier post generated high interest. 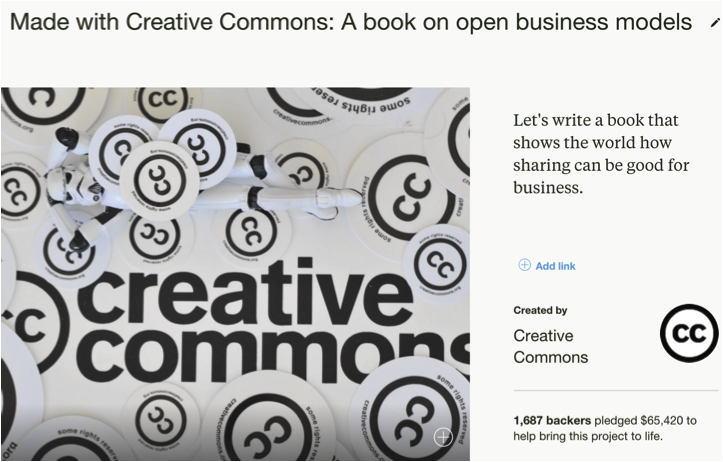 Turns out there are lots of people and businesses trying to figure out how to use Creative Commons to openly share while at the same time operating and sustaining a business. Early work responding to that interest revolved around using the open business model canvas and questions as a tool for depicting and designing open business models. This helps establish a common framework for what a business model is and how to think about it. It also creates a means of dissecting and analyzing an existing business. 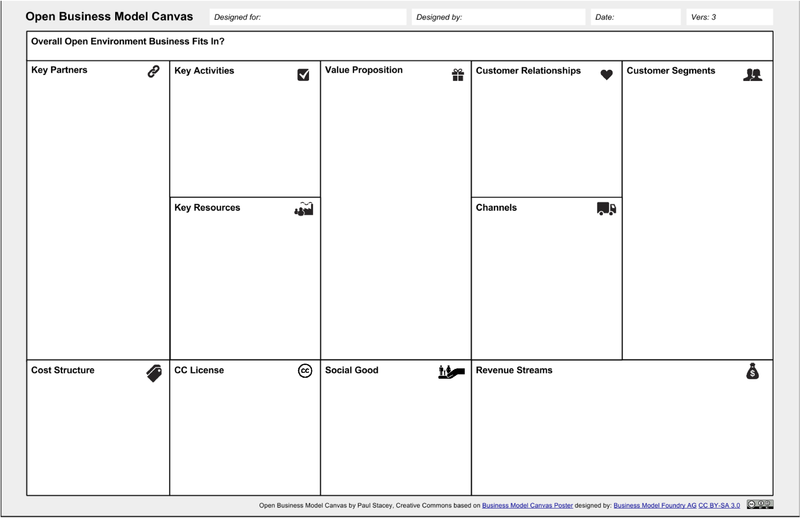 I found it really interesting to autonomously fill out an open business model canvas from what a business says about itself on its web site. I liked to then broaden out and find stories others have written about them as a means of finding interview material, filling in gaps, and getting an outside view. Through these activities you can use the open business model canvas to research and analyze existing businesses. An initial focus on four business model building blocks – 1. customers, 2. value propositions, 3. social good, and 4. revenue streams, generate the best results. But it’s also really helpful to fill out and think through every building block element in the canvas. We did this for platforms and with startups, non-profits, and existing businesses. Colleagues at Creative Commons and I did this for various online platforms that use Creative Commons licenses or have integrated them right into their platform as a service for end users. Doing this independently is a means of better understanding just what a business or platform does and how important Creative Commons licenses are (or could be) to them. It’s always fascinating to compare canvases multiple people create independently for the same business. Having each person share with others what they come up with inevitably reveals facets of the business others didn’t see. Sharing canvases with each other stimulates conversation and dialogue around how an open business works and leads to a common understanding of the organization. It’s useful to create a single new canvas combining the findings and insights from all into one shared depiction. We also did open business model workshops with groups of people. Some workshops were done for participants who were all from the same organization, others for consortia of partners working together on a shared initiative, and still others for mixed groups of people from different businesses. Workshops explored themes and concepts associated sharing, open innovation, open source software, and open business models. Real world examples were used to show how others are doing it. Hands-on activities put things into practice. As we dug deeper into these activities there was a growing realization that this work is really important and part of something bigger than initially conceived. This realization led my colleague Sarah Pearson and I, with the support of all our Creative Commons colleagues, to do a Kickstarter campaign in the summer seeking to raise additional funds and write a book profiling businesses who use Creative Commons licenses as an integral part of their business model. We were thrilled to meet and exceed out campaign goals. Thank you backers! As part of our Kickstarter campaign we made a commitment to regularly write about what we were learning and key insights we were gaining. I’ve been doing that writing over on Medium here. I really feel fortunate to be doing this open business models work – it’s fascinating. I’ve come to see it as being part of what I’m now calling the “abundance economy”. Doing this work I get the wonder and excitement that comes with new discoveries. I was thankful to receive this fall an invitation from David Porter and Mary Burgess to provide some video material for their keynote address “Supporting Open Textbook Adoption in British Columbia” at the recent Open Education Conference in Vancouver. They asked me to provide a short video detailing my start in Open Educational Resources (OER) in BC, how I see the current situation, and what I think BCcampus should do next. I’m super proud of the work BCcampus did and continues to do today. Really enjoyed David and Mary’s retrospective. My interest in understanding and fostering the Commons continues. And I have been reading widely and deeply about it. Wow, those are some big numbers. Seems there is a growing interest in the Commons, not just by me, but many other millions. Thrilled to have been part of making that happen with an amazing team of CC’ers at HQ and around the world. Open business models and the growth of the Commons. In our capitalistic world competition for limited resources and profits are the driving forces of business. Social value, environmental value, and other non-monetary forms of ROI are rarely factored in to the bottom line. But some businesses are incorporating social goals into their operations and adopting triple bottom line frameworks. Some are becoming B Corporations. TedX talks like this one from Jay Coen Gilbert are influencing the thinking of entrepreneurs. And still others businesses are eager to create a business that is not only socially responsible but also modern in its use of digital, and open licensing strategies where the aim is to maximize access, use, and distribution. 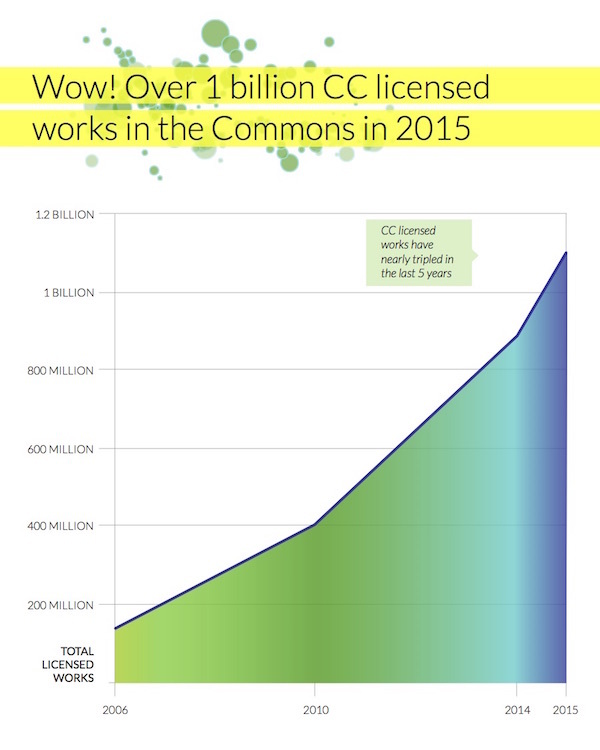 For many entrepreneurs use of Creative Commons is a key enabler of both social goals and financial success. Startups and existing businesses are exploring new alternative business models using Creative Commons licenses as either an enabler or core component of their business – see the many examples at TeamOpen. For every one of those examples there are many others who want to move in that direction but don’t know how. It’s not easy to figure out how to run a business that is both financially sound and socially responsible. It’s not easy to transition business models from strategies that are focused on locking customers in and producing products and services that are not easily copied, to one where you give customers choice and encourage them to copy, modify, and freely distribute your products and services. It’s a big change. One of the most frequent questions I get in my Creative Commons work is “How do I earn a living, pay the bills, and keep the lights on if I openly license my work and give it away for free?” Underlying this question are deep seated needs to a) be financially compensated for the work we do, b) manage costs and revenue responsibly, and c) not have others unfairly earn income off your work. These needs are matters of survival and social norms we operate under in a society based on capitalism. This question and others like it come not just from people in the private sector but the public sector too. Here are a few variants of the question. One public sector variant pertains to sustaining open initiatives that receive special grants or startup funding. When the one-time special funding runs out how does the open initiative sustain itself? What are the models for sustainability? In the private sector, startups are designing businesses around openly sharing as much of their product and service as possible for free, while at the same time generating enough revenue to operate a business. What are the business models for that? This is something that really interests me and I’ve written about the economics of open and open business models before – see here and here. This year, through gracious funding from the Hewlett Foundation, my Creative Commons colleague Sarah Pearson and I, are leading an open business models initiative that aims itself squarely at answering questions like these. We aim to make visible how open business models work and provide tools and strategies for designing and developing your own. We want to do this work in a community-based way with all of you. 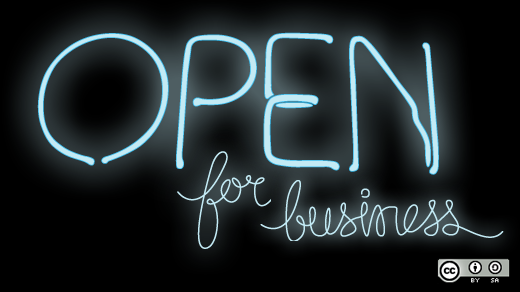 We published a Creative Commons Open Business Models Call For Participation blog post today. As you’ll see in the Open Business Models Participation Activities document we’ve also created a Creative Commons Open Business Models Google+ community as a forum for sharing, participation, and interaction. We’re just getting started but I’m totally excited about doing this work. I think its potentially a really big thing and hope you’ll all consider participating in this work to grow the commons through open business models.